Jen and Will's wedding at The Logan Hotel was a sophisticated show of "red, white and blue." Jen's preference for lush, overflowing floral designs made for a gorgeous display of arrangements from her bouquet, to the centerpieces, to the floral chandelier. The unseen element that helped bring all this together was the talented planners at Kyle Michelle Weddings, who made sure the whole event was delivered without a hitch or hiccup. Pat Furey Photography has a tendency to make every event look like a dream. This talented photographer duo can do no wrong, and it is always such an honor to have our work be in front of their lens. Yes, yes and yes to everything about this bouquet! That huge blush dahlia, pink spray roses, deep red amaranthus, blue thistle and bunches of vines and eucalyptus made this just as colorful as it was full. The collection of trailing ribbons added movement and elongated the cascade. Will's red rose and thistle bout had an incredibly classic look against his black tux. We went big with these altar arrangements so that they would fit in against the ornate backdrop of Jen and Will's church ceremony. Even with the size of the arrangement, we love how well those pink-tinged anemones stand out! The shades of red and blue continued into the reception space. Guests were welcomed with this standing arrangement of blue hydrangea, red roses, thistle, eucalyptus and amaranthus at the placecard table. The funky shape makes this piece so interesting and brings a certain level of artistry to an otherwise simple set up. If there's a venue that our gold mercury trio doesn't look good in, we haven't found it yet. Whether they are clustered together or spread out along the tablescape (as pictured above) their simply stated elegance is unmatched. A runner of flowers is, of course, a must have. The variety of arrangements found throughout the reception space really made it seem that gardens had bloomed indoors. There were so many natural elements found sprouting up in every corner that it completely transformed this urban venue. 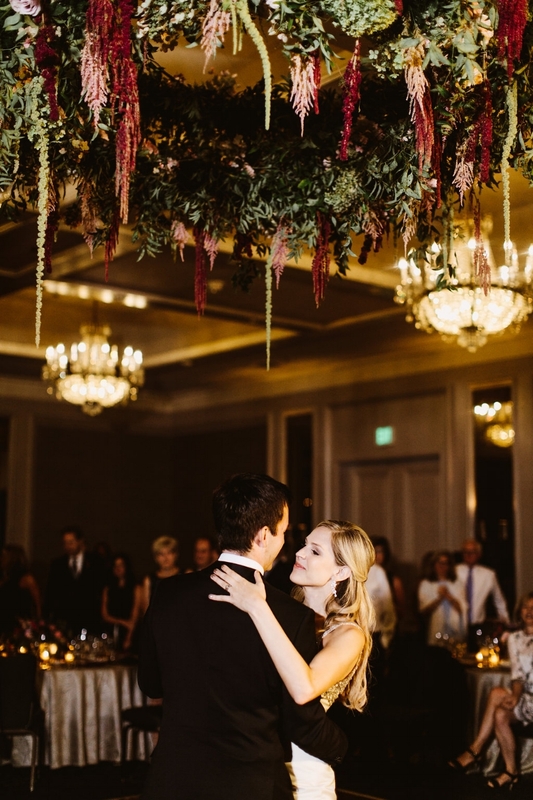 Just when they thought the flowers were all around the room, guests could look up and see that they were coming down from the ceiling as well. There's something about a floral chandelier in the city that makes our heart skip a beat - it's so unexpected, yet so perfectly fitting. The couple got cozy at their sweetheart table, snuggled up in our love seat and emcompassed by a garland of flowers.